US Marine CorpsMembers of the 5th Special Forces Group conducting weapons training during counter-ISIS operations at the al-Tanf garrison in southern Syria. Moscow, Tehran, and Damascus have repeatedly accused the US of training Islamic State fighters at the al-Tanf garrison in Syria, but all they have been able to do is complain about it. In reality, the base disrupts the flow of weapons from Iraq to Syria. It also has served as a training ground for Syrian rebels fighting the Syrian government – rebels who US analysts say are not terrorists. Russia and the Syrian government warned the US in early September that they planned to carry out counterterrorism operations near a key US garrison in southeastern Syria known as al-Tanf, where several hundred Marines have been stationed since at least 2016. But the US responded with a live-fire exercise, and the Russians backed down. In fact, the al-Tanf garrison has long drawn the ire of Moscow, Tehran, and Damascus – but all they have been able to do is complain about it. 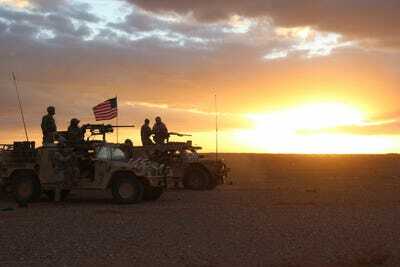 Without any real evidence, US adversaries have lobbed many rhetorical attacks against the US forces accusing them of harboring or training terrorists at al-Tanf. Damascus and Russian state-owned media even claimed in June that the US was preparing a “false flag” chemical attack“identical to the kind that took place in Douma” at al-Tanf. “The U.S. led Coalition is here to defeat ISIS, first and foremost, and that is the objective of the presence in at al-Tanf,” US Army Col. Sean Ryan, a spokesman for Operation Inherent Resolve, told Business Insider in an email. “No U.S. troops have trained ISIS and that is just incorrect and misinformation, it is truly amazing some people think that,” Ryan said. “To the Russians and Iranians, almost any group fighting against the Syrian government can be labelled a terrorist group,” Lamrani said. So why do Russia, Iran, and the Syrian government care so much about this garrison? “I’d say that the primary reasons why Iran cares about it so much is, again, it blocks the Baghdad-Damascus highway,” Lamrani said. Tehran uses the highway to transport weapons to the Syrian capital of Damascus, where the government is based. “The reason they want the land route is that it’s easier to bring [weapons] across land in greater quantities, and the shipping route is very vulnerable to Israeli interception, and the air route is expensive and often gets hit by Israeli airstrikes,” Lamrani added. The Russians and the Syrian government have “open channels” with the SDF and want to negotiate – not fight – with them, Lamrani added. But Moscow, Tehran, and the Syrian government’s ire might go beyond just stymieing the flow of weapons to Damascus and training rebels. “There’s a history at that garrison at al-Tanf,” Max Markusen, an associate director and associate fellow of the Transnational Threats Project at the Center for Strategic and International Studies, told Business Insider. “I think that the Syrian regime, the Russians and Iranians, would see it as a [symbolic] victory if the United States pulled out of there than just sort of tactical level objectives,” Markusen said, adding that there’s much resentment for the US having trained rebels at al-Tanf. But they haven’t sought to use force to expel US troops because “the costs of escalation are too high,” Markusen said. So they’re relegated to discrediting the al-Tanf garrison.